It’s “The Year of the Writer,” at least for those who attended the 2013 National Conference on Peer Tutoring in Writing (NCPTW) in Tampa, Florida in November. The conference theme this year invited tutors to consider aspects of their own identities as writers, as well as the writing identity of the students they tutor. 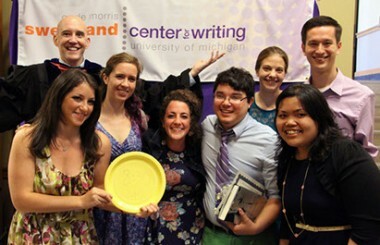 Three groups comprised of the program director and eight undergraduate writing tutors affiliated with the University of Michigan’s Sweetland Peer Tutor Program traveled to Tampa and presented their research. Logan Corey, Lauren Fitzgerald, Zoe Kumagai, and Zeinab Khalil presented “Clothes in Our Community: Writer Identity and Self-Expression.” Drake Misek, Jamie Nadel, and Lila Naydan presented “Tweeting Theses, Papers to Posts: The Dialogue between Digital and Academic Discourse.” Andy Peters presented “That Sounds Dope: Negotiating Non-Traditional Discourse with Standard English in the Writing Center.” Corey, a former peer tutor and UM alum, won the prestigious Burkean Parlor Grant—a cash prize awarded by the conference that helped defray the cost of her travel. 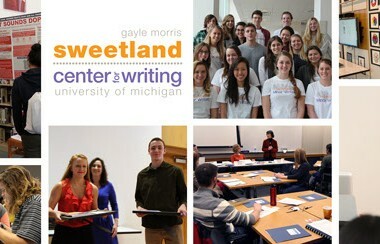 Congratulations to Logan Corey and to all of Sweetland’s excellent tutors! They showcased the University of Michigan as an institution committed to engaging undergraduates in developing connections between theory and practice.